We feasted on hearty French fare: an onion soup with Gruyère cheese, medium rare steak sautéed in butter with a Bordelaise sauce and purées of spinach, carrot, and garlic and finished with a bittersweet chocolate soufflé. It was a reminder of the trip that we were supposed to be taking that moment in France. But with train strikes and a country in chaos, we had quickly changed plans and headed to Mexico. And so we sat in a gourmet French restaurant at the Grand Velas Riviera Maya in the middle of the Yucatan jungle drinking our Côtes du Rhône. 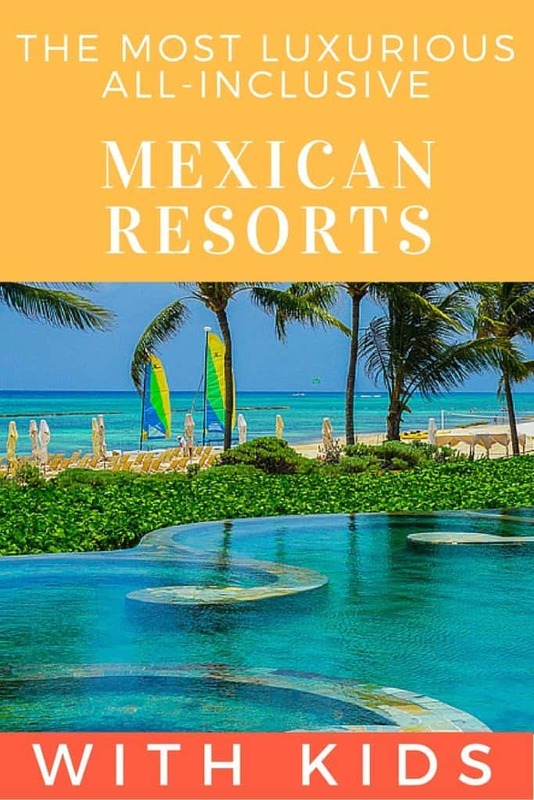 Opened in 2008, the Grand Velas Riviera Maya is situated in Playa Del Carmen and is one of four Velas properties that are 100% Mexican owned by brothers Eduardo Vela Ruiz and his brother Juan Vela Ruiz. Its all-inclusive feature made a few families we spoke to a little wary on how truly luxurious and gastronomically superb this resort could possibly be. Were we all in for a pleasant surprise. The Ambassador section of the Grand Velas. All-inclusives in Mexico conjure up images I have of my own childhood at Club Med resorts that played “Hands Up” around every corner and where Lionel Richies’s “All Night Long” literally played all night long. The Grand Velas is in sharp contrast. The Frida Kahlo mural at the Grand Velas Riviera Maya Mexican restaurant. The beauty of it lies in its calm, serene simplicity and the jungle literally at your room’s front door. At every turn, lush green fauna and palm trees envelop the buildings and its guests. All lobbies and hallways are open air spaces maximizing natural sunlight throughout. Neutral walls with minimal artwork or adornment and massive dark wood guest room doors enhance the jungle effect. Kids’ clubs, fitness centers, and gift shops are discreetly scattered throughout the buildings and with minimal signage on the walls, we got a little lost on our first day. The guest rooms are a continuation of neutral colors of beige, taupe, and clay with dark wood accents and for a pop of color; our room had two red and orange paintings by local artists. Our stunning balcony overlooking the beach was overgrown with colorful native Yucatan flowers. The moment the first ocean breeze enters the room after a day of travel is a good one. Minibars offer all-inclusive room snacks and drinks. Our addictive turquoise views at the Grand Velas. The whirlpool tub overlooks the rooms at Grand Velas. The resort is separated into three different buildings: the main Ambassador building for families wanting the beach and expansive infinity pool, the Zen building in the jungle which also houses the convention center, and the Grand Class building which is for adults and children over the age of 12. 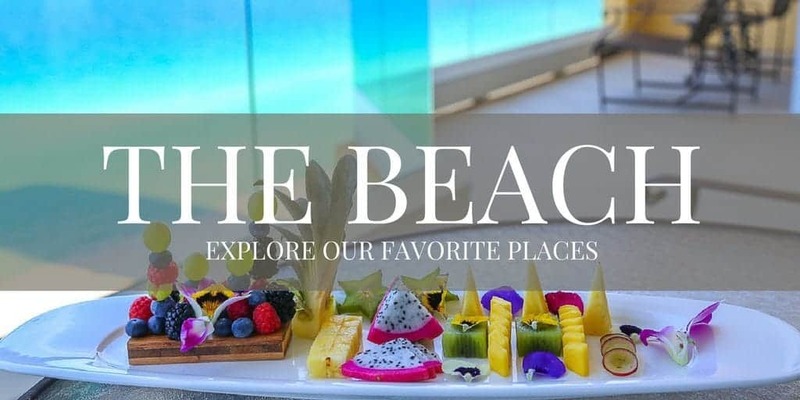 Most families with young kids will steer towards the Ambassador section with its easy access to the beach and all day buffet restaurant Azul. I loved the Zen building, though, for its pool and quieter vibe. The pool at Zen is a multi-tiered infinity pool with different sections and depths that are perfect for your stronger swimmers who want to swim laps and your younger ones who need a splashing pool. Tiled in blue, green, and brown, and surrounded by lush vegetation you get the sense that you’re swimming in a cenote, a Mexican jungle cave filled with water found only in the Yucatan jungle. A view from our room overlooking the pool and ocean at the Grand Velas. Nature surrounds the resort at Grand Velas. The Zen pool at Grand Velas Riviera Maya. The Grand Velas Spa is renowned and award-winning. As I experienced it, one does not go for a treatment but rather a journey. Instead of lounging in my robe drinking tea and reading a Vogue magazine, I had an agenda and was kept to it quite timely by my lovely spa assistants. The Mayan jungle surrounds the spa and at every turn are large panels of glass showcasing the rock and fauna just outside. Inside, the same hotel décor continues with clay walls and dark wood. At the center of the spa is the hydrothermal space with the sounds of rushing water from its main pool. Hydrotherapies offered at every temperature at the Grand Velas Spa. Water abounds at the Grand Velas Spa and is intrinsic with each treatment. I scheduled the “Hydrothermal Journey”, a series of water experiences that awakes your senses and circulation. As someone who likes the shower not too hot but needs the pool to be a minimum of 82 degrees, I wondered how my temperature quirks would handle this. I started off with a lukewarm shower to get wet and then a hot sauna with an ice-cold face cloth and cucumber slices for my eyes. So far so good. Next however came the ice room, which admittedly felt invigorating as I covered myself in Aloe Vera and took in the ice-cold breeze. Next was the steam room, a dark hot room with colored LED lights on the ceiling. I just closed my eyes and did some deep breathing exercises…it was heavenly. I was initially grateful for the “Experience” shower that followed with a lovely lukewarm spray. I was not prepared however when it shut off and started shooting out powerful sprays of cold water. I let out a small yelp and hoped no one heard. Plan pools of different temperatures at the spa. A sanctuary of calm for a massage at the Grand Velas spa. A poolside massage at Grand Velas Riviera Maya. After this it was off to the clay room where I covered myself in clay and conditioner for my hair. Very relaxing until I was told to rinse off and accidentally turned on my personal shower head too soon, spraying the women across from me with cold water. She let out a similar yelp and I apologized profusely for adding an unintended addition to her journey. After the rotation of hot and cold rooms, it was off to the pools where I went through a course of hot and cold foot baths, a perfectly warm chlorine-free pool with jets of water for the back and neck, and finally a recline in the pool bed for 5 minutes before being whisked off to my massage. The massage was another superb journey in itself. In keeping with the spa’s focus, it included numerous sensory touches such as an initial foot bath in millet seed, a choice of peppermint or rosemary herbs for deep breathing exercises, and listening to seashells. A perfect start before the massage had even begun. The Spa boasts their Signature treatments with their methods coming from around the world including the Journey through Ancient Mexico, the Mediterranean Voyage, and Memories of India. A visit to this unique spa that has won numerous awards is a must do. The Grand Velas boasts a 3:1 guest/staff ratio and every guest is assigned a personal “butler” concierge. Ours was a polite and polished young man named Kevin who had an incredible knack of knowing just what we needed and when. Always on top of making sure we had our dinner reservations, transportation to the airport, special services, etc., he truly made the experience relaxing with his “No problem, I can do that” mantra. My kids also put Kevin to the test planning a Father’s Day surprise for my husband that included his favorite breakfast and a chocolate cake and tea in the afternoon with a note that read “Congratulations”…well, close enough we thought. Kevin, our butler, plots a Father’s Day surprise. My kids requested a Father’s Day surprise. I suppose they didn’t really believe that was my husband’s name. The epitome of family luxury: chocolate cake in the bubble bath. We had asked for something special with dessert that night at the Mexican restaurant. I didn’t give it much thought until I saw the waiters approaching our table with a massive sombrero hat and cake with candles. In this restaurant with its beautiful murals and walls of streaming water, we had all eyes on us but when the waiters starting singing “Happy Birthday” and had my husband try to blow out a trick candle, my son’s forehead touched the table in surrender and embarrassment, and I had to laugh. I wonder if Hallmark hadn’t yet marketed Father’s Day in Mexico. Many kudos to Kevin for his above-and-beyond service and for making a great memory. “Happy Father’s Day” became “Happy Birthday” by the time the request reached the kitchen. Son horrified. A true family vacation includes some couple time to decompress and connect. The Grand Velas Riviera Maya kid’s club affords parents the opportunity to do this with their flexible drop-in policy. The club is open from 9:00am to 11:00pm and parents can drop off as they wish. The idea behind the late hours is to allow parents to enjoy their meals given that so much of the resort’s focus is dinner time. The kids’ club at the Grand Velas Riviera Maya. The kids’ club at the Grand Velas Riviera Maya offers piñata making. Our kids profess starvation at home if they eat past 6:15. We feared kids’ club meltdown on our night there and briskly headed towards the restaurant to check on them only to see a look of sheer horror on my son’s face as we approached. Apparently having your parents come to the restaurant is not cool—especially for newly made young sophisticates who eat at 8 p.m. and socialize with newly made friends. My husband and I discreetly scampered away to the other side of the restaurant and had another glass of wine while we waited for our kids to finish their meal…definitely a first! Entering the Grand Velas Teen club. The teen club at the Grand Velas Riviera Maya. Billiards at the Grand Velas Teen club. Fancy game cubes with stereo sound at the Grand Velas Riviera Maya Kids’ Club. Our 8 year-old son loved the club’s video games while my daughter entrenched herself in arts and crafts. Over the course of 4 days, my daughter worked on a piñata, and it had her wanting to go back every day to finish it before we left. In high season (Christmas, Easter, and Summer), the youth programs kick into full gear. Kids are presented with backpacks and stuffed animals when they arrive and more activities such as campfires, fireworks, theatrical shows, zip lines, and more are available. Working on her piñata over several days at the kids’ club. There is also a teen’s club that is a great space for teens to hang out, drink smoothies, and race cars in the club’s video game cubicles, each one with their own surround sound system and vibrating chairs. I was told the biggest fans of these cubes are actually the dads. Our first couples of days at the resort were rainy which puts any resort to the test of occupying the kids. With the rooms so spacious, including a couch in the sitting area, and a whirlpool tub, we were able to relax, read, and watch movies, even from the tub. The resort also has a karaoke bar, which kept us all entertained for hours singing Katy Perry’s “Fireworks” and throwbacks to the 80’s. Enjoying a little rest at the main pool at Grand Velas. In keeping with the minimalist approach, the pools at the resort are not teeming with water slides, fountains, or mountains of pool toys. And this is ok. Our kids had so much fun just playing with other kids. The poolside menu is extensive and part of the all-inclusive feature, which makes ordering a quick plate of chicken nuggets and a couscous and salmon salad a breeze. Noodles at the Zen pool at Grand Velas Riviera Maya. Sibling bliss at the Zen pool. Both the Ambassador and Zen have multi-depth infinity pools so children of all ages can safely play in the water and also under the watchful eye of lifeguards. 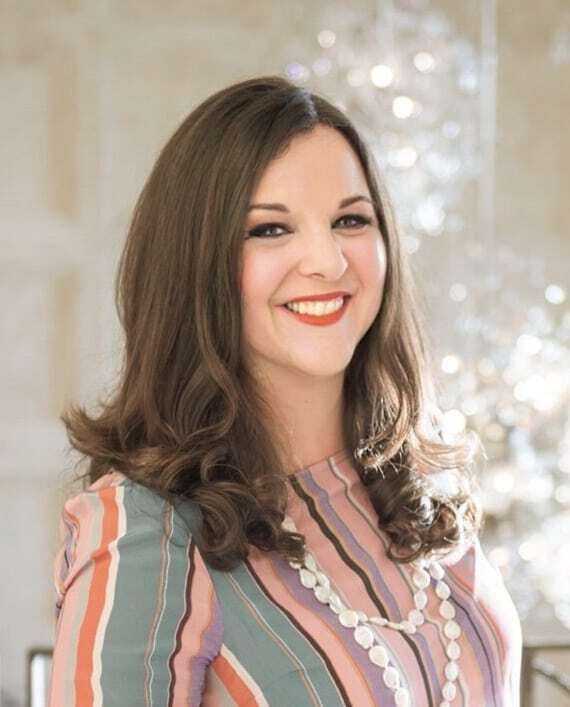 For moms who want the spa treatment but can’t pull themselves away from their infants, the resort just recently added spa huts a stone’s throw away from the pool with the intent of putting moms and dads at ease that they are close by if needed. When the resort pool feels as big as the ocean. With the pool and all-day buffet restaurant right off the beach, it’s easy to spend the day just rotating between the three. The beach itself is beautiful white sand that feels like talcum powder. The water is crystal clear blue but note that a large portion of reef start fairly close to the surf so water shoes are a must. Eight years ago the resort built an artificial barrier further out that breaks the larger waves leaving the swimming area much calmer and safe for the kids. Hobby cats and snorkeling are available although for the latter I would suggest doing an off-resort excursion. Learning about food preparation at the Grand Velas Riviera Maya. Breakfast buffets at the Grand Velas were extensive. One of the reasons many luxury travelers hesitate to try an all-inclusive is the food quality. The Grand Velas intends to be one of the most serious destinations for foodies in the Rivera Maya. We tried nearly every restaurant during our stay, and were consistently pleased by the quality, variety, and excellence in presentation. Elegant adult-only restaurants offer French and International cuisine at Grand Velas. Beautiful steak presentation at Piaf at Grand Velas Riviera Maya. There are several restaurants serving different cuisines traditions of Mexico, Italy, France, Asian fusion, and many with eclectic menus. Three retain a 16 and over rule, but the rest are family friendly. Cocina de Autor is the resort’s signature restaurant that has won a Five Diamond award, one of the few we did not try, but those we did were exceptional. A chocolate fantasy dessert from the Grand Velas. Every dessert surpassed the next in presentation at the Grand Velas Riviera Maya. Breakfast and lunch are served buffet style in both the Ambassador and Zen buildings, but it is very easy to enjoy a meal poolside, and room service is also available. I was told that during the busiest seasons, that room service can be the best option for breakfast when buffet lines get crowded. Many lounge spaces to enjoy wines and cocktails at Grand Velas. The resort kicks into high gear at Christmas, Easter, and the summer. It’s all hands on deck with the hotel offering expanded kid’s club activities, nightly shows, fireworks, etc. The Grand Velas Riviera Maya has a Christmas program that provides a Christmas tree for your room with your choice of donning the lights yourself or pre-lit and a menu of gifts to choose from for your kids to save bringing them from home. I would love to return and see the resort in its full glory. But keep in mind that reservations at the restaurants might be limited during these times. We actually timed our visit right before the summer crowd arrived and had the resort to ourselves. We loved the ease of eating at any restaurant and time that pleased us that day and having the entire Zen pool to ourselves. There are pros and cons to both the high and low season of course but in the end, any time spent at the Grand Velas Riviera Maya is extraordinary. A perfect night time family swim. Before we arrived at the Grand Velas Riviera Maya, we had spent 6 days in Cozumel where my husband spent much of his childhood with his friends. We spent wonderful afternoons with them on their boat and had big group dinners. They had children who played with my kids and compared stories of schools and summer vacations. We had a car and used this to explore the island including going into local markets to buy shoes for my daughter and even coordinating laundry at the local laundromat. It was the more authentic immersion I wanted before we headed to the Grand Velas Riviera Maya. 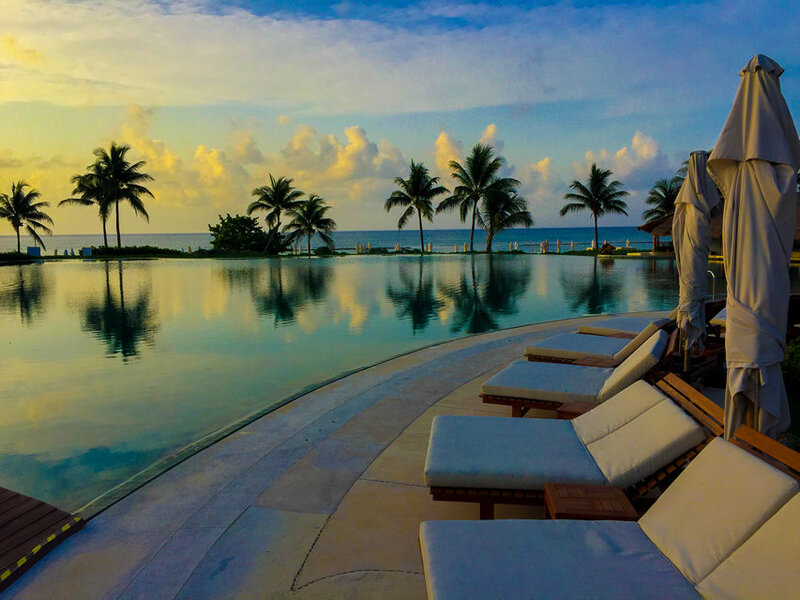 The Grand Velas is a true luxury 5-star resort that just happens to be in the Yucatan Jungle. 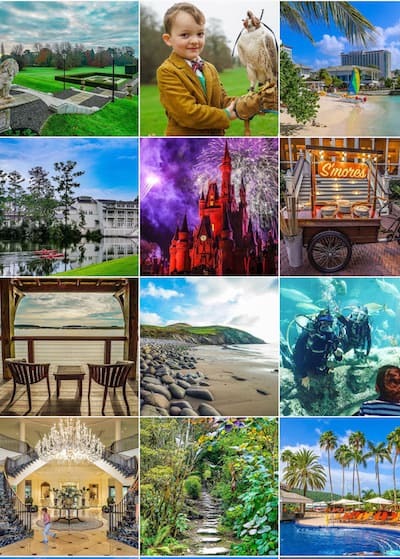 It’s absolutely stunning in its natural beauty, and the service, food, and accommodations are top notch. For a more authentic experience of the area, parents may want to supplement the resort stay with excursions. Tulum, cenotes, ruins, and all the wonders of the Yucatan are right at your doorstep at the Grand Velas Riviera Maya. Welcome to the jungle where they’ve got fun and games. And 80’s karaoke. Although we were guests of the Grand Velas Riviera Maya, these opinions are my own. This looks like a fabulous resort! We are trying to pick a vacation destination for the Christmas holidays and will add this resort to our list of possibilities!! Amazing! I have been thinking about going back to Mexico. The first time we went with our little one we stayed in Cancun but visited the Riviera Maya. When we go back, I think I would much rather stay in the Riviera Maya and the Gran Velas looks like it would be the perfect place. I like how it is family oriented with things for the kids to do so parents can also decompress. Thanks for sharing. Reading this post is like taking a virtual luxury vacation! Love the pool photos and the story about your kids and their sophisticated dinner.